The first of six new products to be released by VaporWorx before the end of the year, VaporWorx is pleased to offer a feature-rich upgrade to your relay controlled fuel pumping strategy. The VaporWorx Intelligent Relay Control (IRC) will provide convenience and safety features that will help protect you and your pride and joy. This system is easily adapted to both new and existing builds by controlling the negative trigger side of a standard automotive relay. 1) Three-second initial key-on prime cycle: At key-on, the IRC will energize the fuel pump relay for three seconds. If a tachometer signal is not sensed, the IRC will de-energize the fuel pump relay. Once a tachometer signal is sensed the fuel pump relay will be energized. The prime cycle can also be used to turn off intercooler pumps so that battery voltage remains high during long key-on/engine-off tuning cycles. 2) Accident safety: In the event of an accident and the engine shuts down, the IRC will de-energize the fuel pump relay. 3) Manual override: Want to set the float level without the engine on? How about running an intercooler pump to reduce temperatures between ¼-mile runs? The VaporWorx IRC has a simple override feature that will energize the relay by grounding the Violet wire in the supplied wiring harness. 4) Have a Ford Racing Coyote Crate Engine package? There’s no fuel shutoff control in the Ford controller. The IRC not only creates this feature, it also has an output to turn on a VaporWorx PWM control system that implements modern safety strategies. 5) Compact size. The compact 1-1/2”W x 1-1/4”D x ¾”H size means it will fit almost anywhere. 6) XLPE wire and sealed connector. 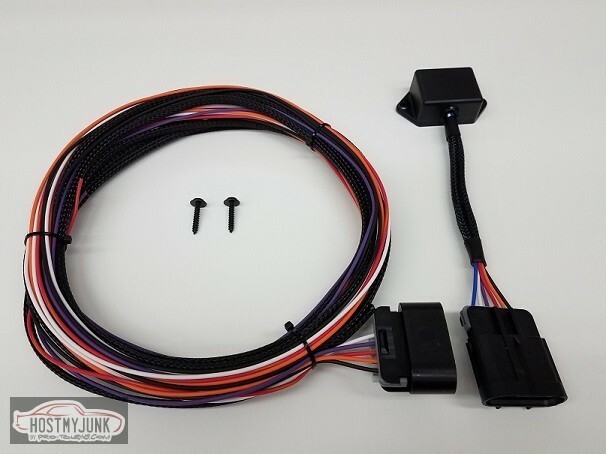 The IRC comes with 15’ of wire for each circuit pre-wired into a genuine Delphi sealed GT150 connector. Wire braid is also included.